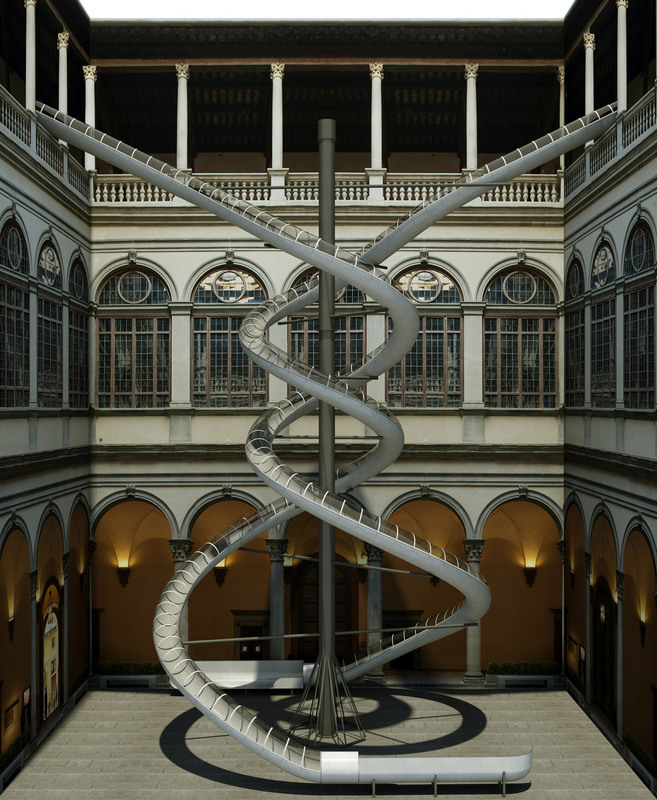 Carsten Höller will explore how plants react to human emotions through his next slide installation, set to be built inside the courtyard of a palazzo in Florence, Italy. The German artist is working with Professor Stefano Mancuso to create The Florence Experiment, which looks into how plants pick up on and react to human emotions. The installation will be built in the courtyard of the Palazzo Strozzi in Florence as part of a wider show curated by Arturo Galansino, the Fondazione Palazzo Strozzi director general. As part of the installation, participants will be handed a plant before sliding down one of the two 20-metre-high slides from the second-floor terrace of the Renaissance palace to the courtyard below. From here, they will descend to a laboratory in the basement, where scientists will be on hand to test if the plants have picked up the emotions of the person holding them as they slid down the slide. Before he became an artist, Höller studied insects as an entomologist and gained a PhD in plant pathology. Mancuso, who is both a professor and a doctor, founded the study of plant neurobiology. Höller and Mancuso’s experiment is designed to demonstrate how human emotions can affect plants, encouraging visitors to examine the empathetic relationship between themselves and the botanical world. A second part of the installation will see two cinemas set up in the laboratory, one screening scenes from comedy films, and the other showing clips from horror films. 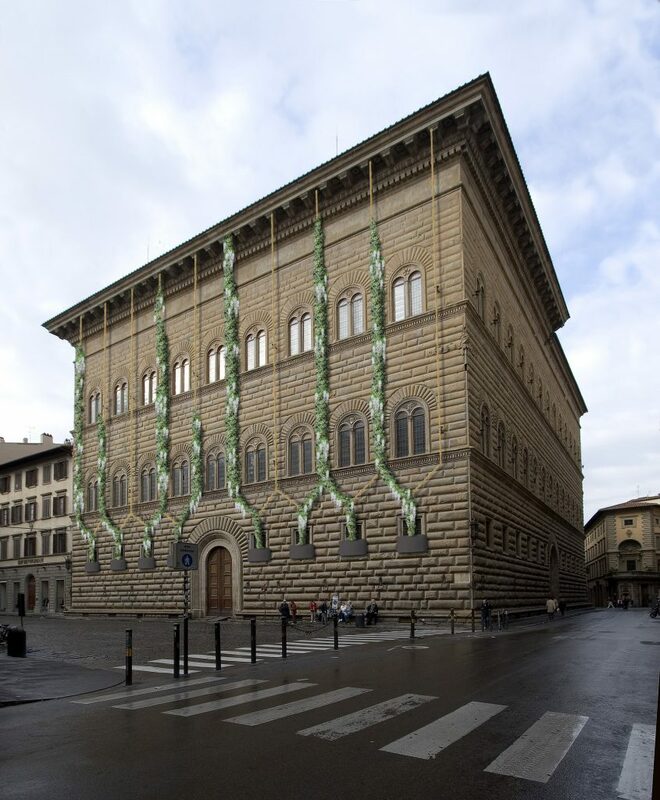 According to Höller and Mancuso, the audience’s reactions to the two different experiences will produce “volatile chemical compounds” in the air, which will then be piped through a series of tubes to the exterior of the Palazzo Strozzi.The compounds will then affect the climbing wisteria plants on the facade. The facade : Carsten Höller and Stefano Mancuso experiment at Palazzo Strozzi, Florence. Over the course of the summer, the vines are expected to grow in different directions in response to the fear or delight of the cinema-goers, plotting a “plant graph” that will serve as a visible demonstration of the wisteria’s ability to pick up on emotions. “Palazzo Strozzi will become a site of real contemporary experimentation and reflection, turning an architectural Renaissance masterpiece into a workshop of dialogue between art and science,” said curator, Galansino. Höller has installed giant slides as part of his interactive art shows around the world. Last month he opened a pair of towers with slides at a shopping mall near Miami for visitors to race each other down. In London, he wove a slide through Anish Kapoor’s ArcelorMittal Orbit, a 76-metre-high chute that whirls riders round a series of corkscrews at speeds of up to 14 miles per hour. The top is transparent in sections, giving sliders views over the city as it rushes past. Images : rendering by Michele Giuseppe Onali.